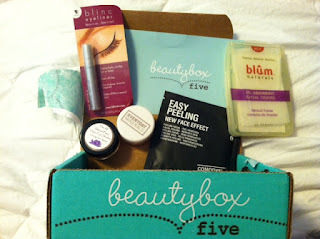 I was excited to try Beauty Box 5. As a subscriber to other beauty boxes, I always like to see what others are sending and if they are right for me! Beauty Box sent me a box to review for free, but as always, my opinions are completely my own. This beauty box did not disappoint! What I loved about the box was that I felt they provided products that many others did not. One of my products was a vegan product, and as someone who has a lot of vegan friends, I really liked that aspect. Of course, I am not sure that my vegan friends would enjoy the entire box, since only one product was vegan. However, it is rare to get a vegan product in a beauty box, and so I felt that aspect did set them apart. I also really liked the variety. They sent both cosmetics and beauty products, and the cosmetics were all very different. I enjoyed the colors, and felt it was a good subscription box. Total value of $14.94. This is a good value for the $12 that the box sells for. They also have a great referral program. If you have 5 people sign up through your referral, you receive 1 free box. I did not provide a referral link above, as the box was sent for review (not purchased). I love the inclusion of the vegan product!! :) That's important to me. Great review, thanks for sharing! interesting box, I like the variety of different things. Looks interesting, and things I've never tried before. Very Cool. Awesome review and Love BB5 so far! I loved my box! I think it is nice! Good review!! The mascara sounds great and I had not heard of this company before. Thank you for sharing and the wonderful break down of the items and their value. I will be now looking into applying for this beauty box.